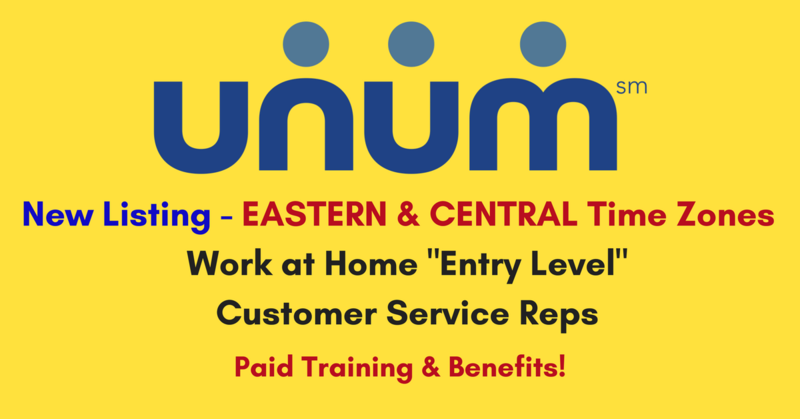 Recently we posted about Unum’s Customer Service openings in the Pacific and Mountain time zones. Now the company is hiring in the Eastern and Central time zones. Average total pay is $31,000 per employee reviews online. The reported range without cash bonuses is $30,500 to $32,000. However, Unum hasn’t confirmed this. The company PROVIDES EQUIPMENT and BUSINESS CLASS INTERNET. Looking for a company that makes an impact? Unum and Colonial Life are committed to protecting the financial well being of our customers through our benefit offerings. As a Virtual Customer Service Specialist, you will be the first point of contact for our customers and a direct representation of our brand. You will have the rewarding job of creating exceptional customer experiences as you act in the best interest of the customer; ensure information is accurate; and operate with empathy and integrity. Customer issue resolution is a priority and we strive to resolve issues on the first call. In this role, you’ll have the opportunity to learn and work with multiple system applications and administrative processes, as you ensure a seamless experience for our external customers and internal business partners. This entry-level role provides a strong foothold into an organization and company with multiple career paths. — Shifts may vary outside the standard 8:00 a.m. to 5:00 p.m.
Click here for full details and to apply. For more jobs like these, check our Newest Jobs & Gigs page. To be the first to hear about jobs like these, like our Facebook page. Good luck in your next steps toward working from home! This entry was posted in Customer Service Jobs, Hiring Companies, Jobs with Benefits, Work at Home Jobs and tagged Unum. Bookmark the permalink.